Disclaimer: I received compensation and promotional gifts for this post. The opinions and text are all mine, except where otherwise stated. It's crazy that I've had this blog for so long and never posted any pork chop recipes. They are a staple in our house, so that is about to change! 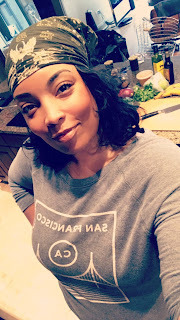 I'm teaming up with the National Pork Board and Black Bloggers Connect to share three grilled pork chop recipes this month. Make sure you stay tuned for all three posts, as I'll be giving away grill kits and $100 Walmart gift cards for a few lucky readers! Update 8/21/05: This contest has ended. For this recipe, I used boneless center cut pork chops which are lean, budget friendly and just as versatile as chicken breasts. Look for thin cut chops as they'll marinate quickly and only need to cook for a few minutes on each side. Speaking of grills, not ten minutes before I got everything out and was ready to light the grill, I looked outside and realized it was pouring. So I ended up doing these indoors on a cast iron grill pan. And then it stopped raining. Of course. But honestly, with thin pork chops that wasn't such a terrible thing and dinner was ready rather quickly. I'll definitely be revisiting this recipe on a sunny day though! 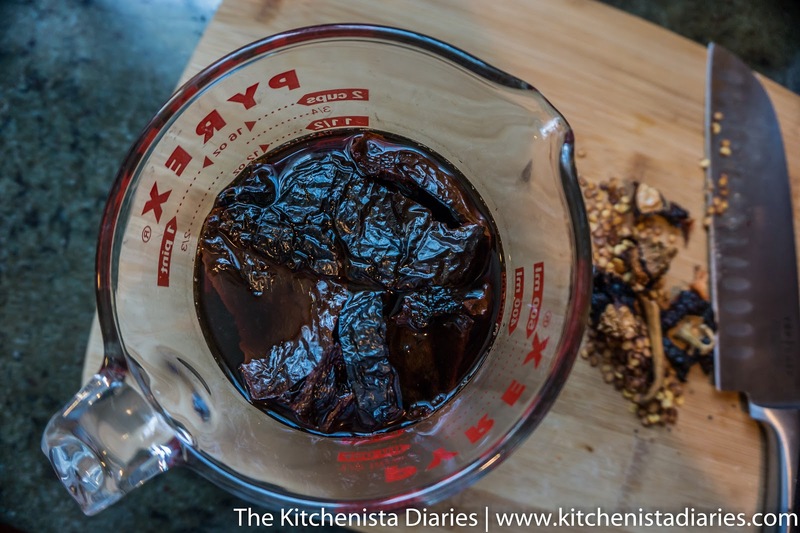 Begin by soaking the ancho chiles so that they will soften up enough to use. Simply cut off the stem and pull as much of the core out as you can, shaking out the seeds. Place in a bowl and cover with boiling water, then step for 15 minutes or so until soft. You can gather up the rest of the ingredients in that time. Once the chiles are softened, add them to the blender (reserve the liquid left behind) along with all other adobo sauce ingredients. Blend until you have a thick, smooth paste. You can use some of the liquid from the chiles if the mixture is too thick to blend easily. You'll need about 1/3 cup of adobo marinade for pork, so store any remaining in a jar. Top with a thin layer of olive oil, cover and store in the fridge for up to a couple weeks. 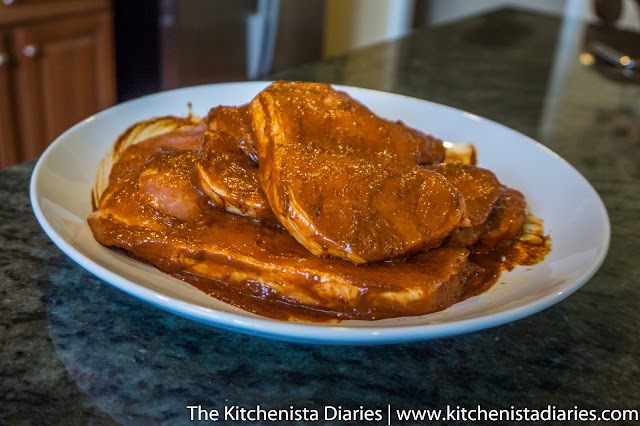 Season your pork chops with salt and pepper, then baste generously with the adobo paste. Refrigerate and marinate for at least an hour or up to overnight. 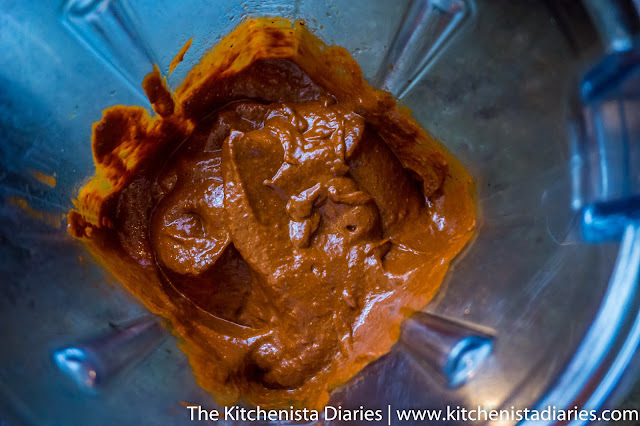 After marinating, wipe off excess sauce before grilling. This will ensure you get a nice sear on your pork. 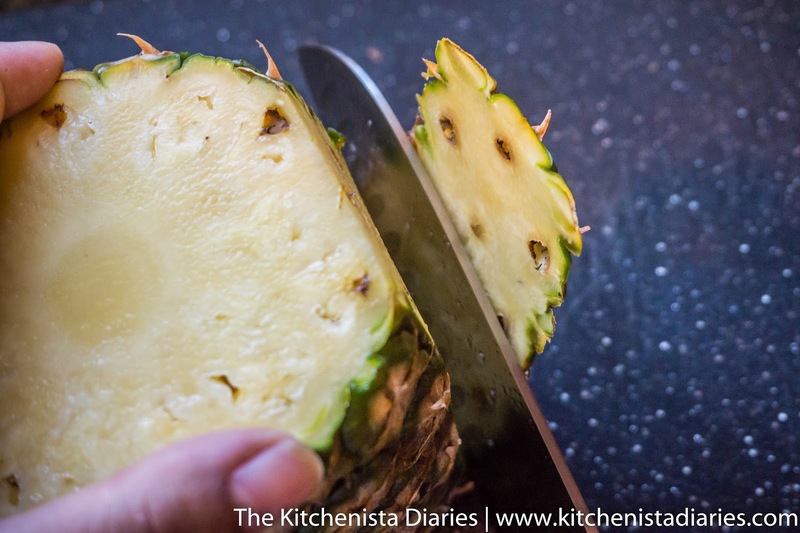 To prep the pineapple for the grill, slice off the top and bottom with a sharp knife so the pineapple can stand upright, then carefully slice off the sides. You can use a smaller paring knife if necessary to trim any "eyes" left behind. Slice into thick rounds for the grill. 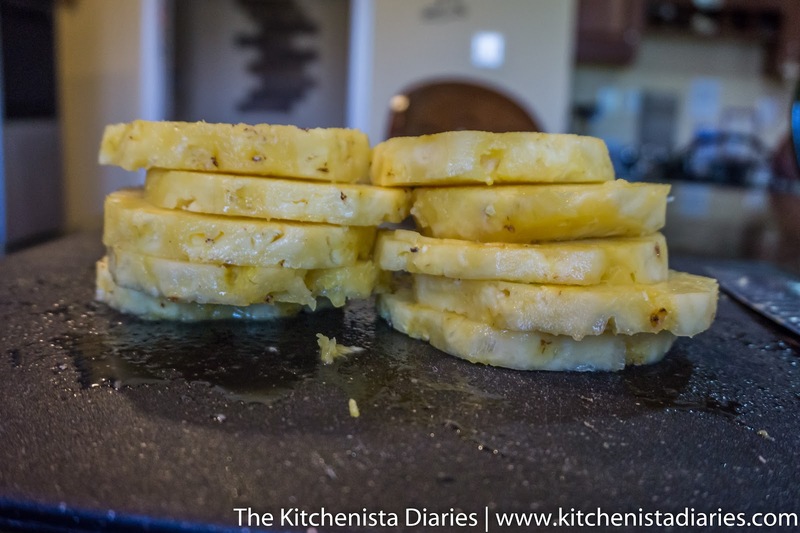 I don't remove the core as it's easy to just cut around it after the pineapple is grilled. Four or five slices is plenty for the salsa, so you'll have plenty left to use as you wish. 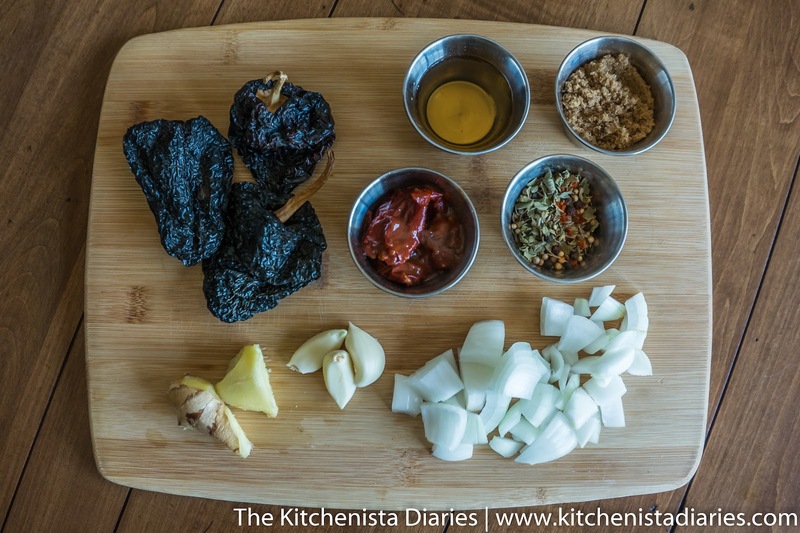 It's a good idea to dice your serrano pepper, slice scallions and chop up the cilantro now so that it can be quickly tossed together to make the salsa after everything comes off the grill. Preheat a cast iron grill pan until smoking hot. If using an outdoor grill, set it up for indirect heat. 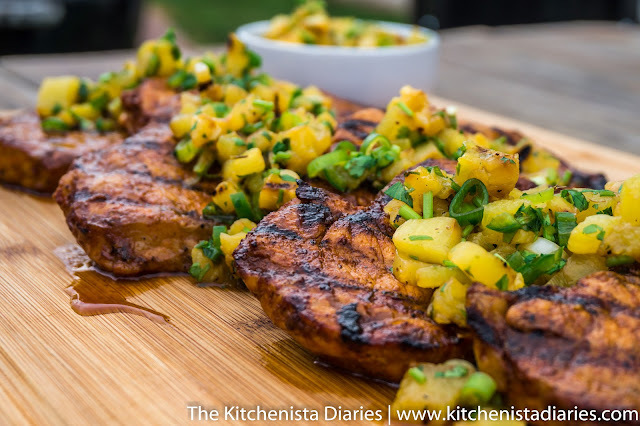 Season the pineapple with a pinch of salt and pepper and place on oiled grill grates. 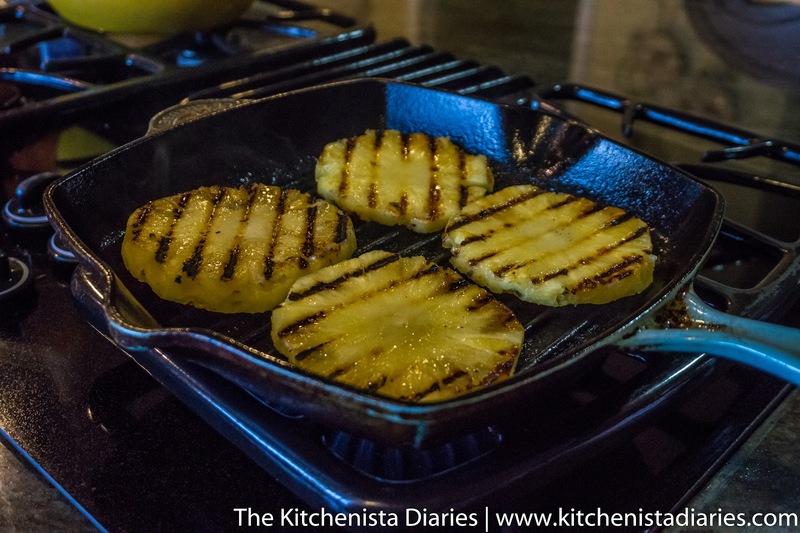 If cooking on a real grill, the pineapples should cook on the cooler side of the grill so they have time to caramelize slowly without burning. Allow the pineapple slices some time to soften slightly and get some good grill marks before flipping and cooking a couple more minutes on the other side, then remove from the grill. 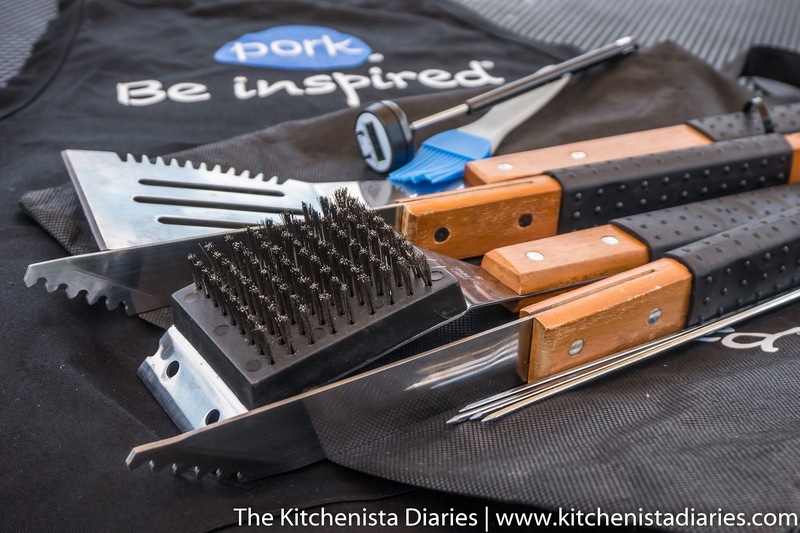 If using a grill pan, simply wipe it off with an oiled cloth before proceeding with the pork. 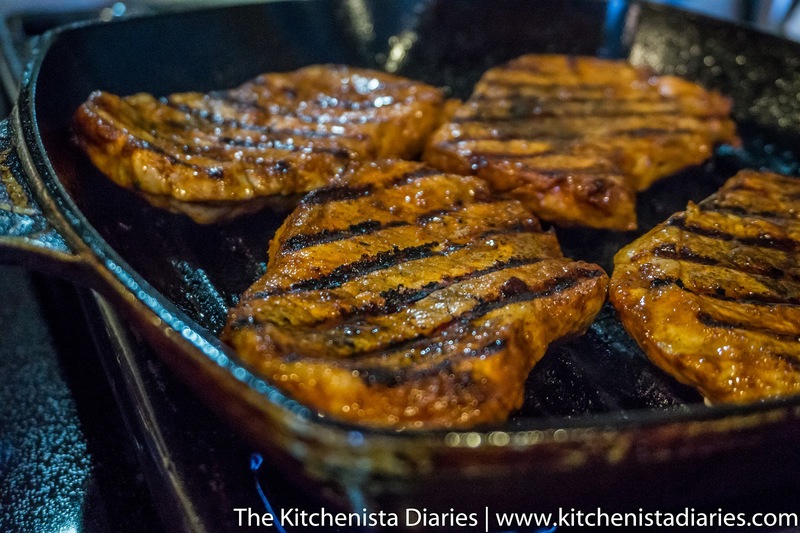 Place the pork on the grill and allow to sear for a couple minutes before moving. 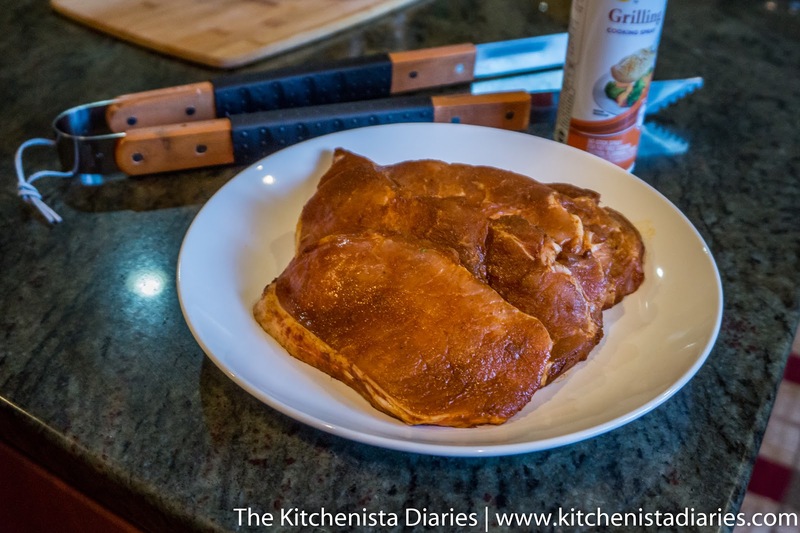 Then flip over and grill the other side until cooked through, another couple minutes. Pork is done when it reaches an internal temperature of at least 145° F. Thinner cut chops are a little harder to get crusty without cooking them through to a higher temp, but I usually aim for no more than 155° F to ensure they are still moist inside. 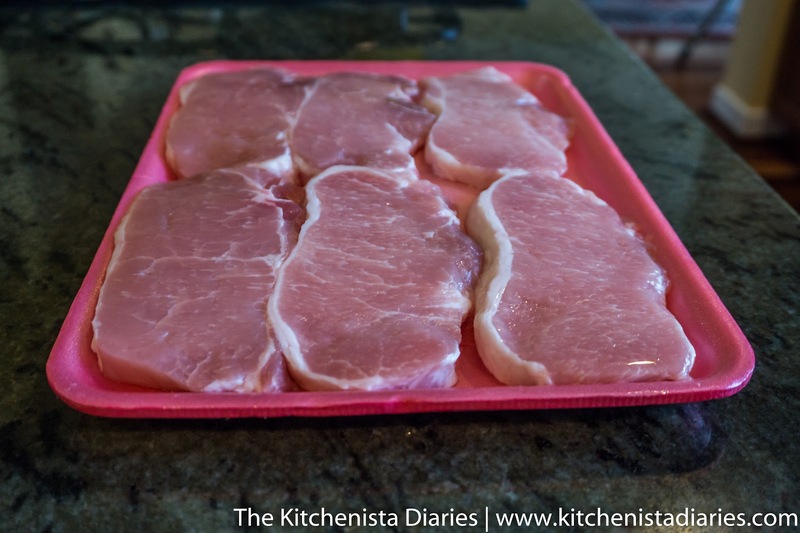 Hit the pork chops with a sprinkle of salt after coming off the grill. If you've set up an outdoor grill for indirect heat, quickly sear the chops on the hotter side of the grill first, then move to the cooler side of the grill to finish cooking through. 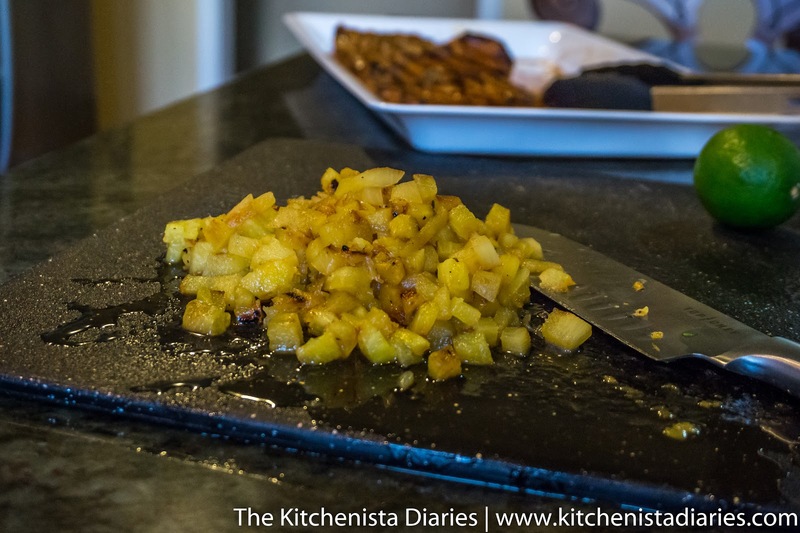 When you're ready to prepare your salsa, chop the grilled pineapple, discarding the core. Toss with the serrano pepper, scallion and cilantro. Add a few squeezes of lime juice and season to taste with salt and pepper. 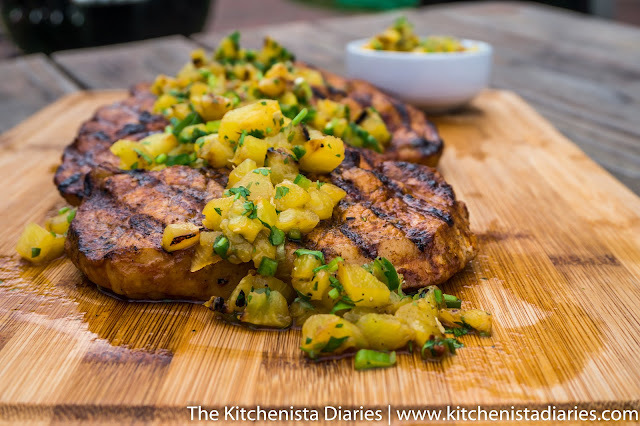 Serve the pork chops immediately, topping with plenty of grilled pineapple salsa! I also have a few grilling kits and $100 gift cards that I'd love to give to a few lucky readers! To enter your chance to win, leave a comment below describing your ultimate bbq dinner featuring grilled pork. 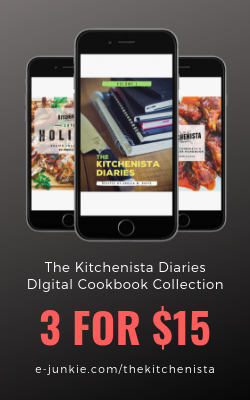 I'll choose my favorite pork inspired meals on August 21, 2015 and announce the winners that week here on my blog. 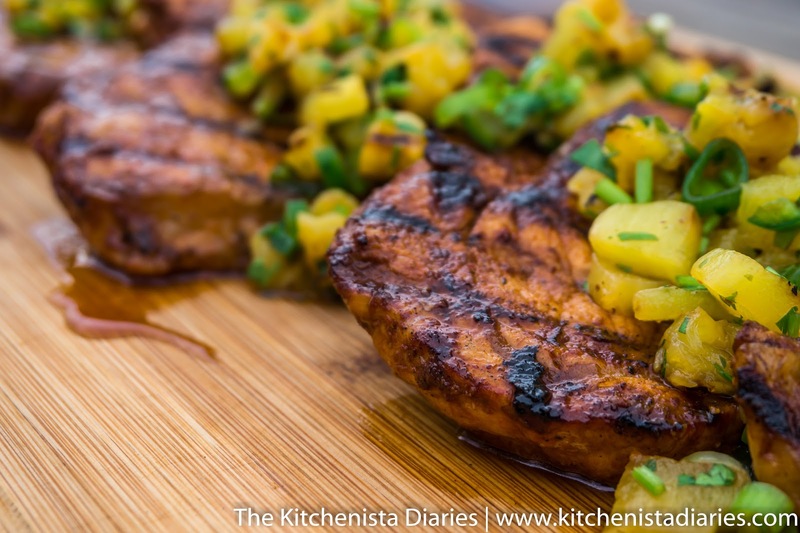 Please share this post to Twitter or Facebook with hashtags #grillporksweeps and #kitchenista to help spread the word! Sponsor's Message: "No matter what you celebrate this grilling season... Pork's Got Your Grill Covered!" Visit grillpork.org to share your grilling holiday and find great recipes and grilling tips. Win free groceries for a year and other great prizes!